Discussion in 'Acquistion Targets' started by zuolun, Sep 25, 2012. I've to thank Milo-Dino for recommending me here as I had genuinely enjoyed myself in this forum. JohnPaul is our Dai Lole. Zuolun is also our Dai Lole. So when our beloved Dai Loles have a misunderstanding, how can we...the Sai Loles...boh chub one? If we boh chub and let them fight ..... wait this place will be bely crowded. I've learned something invaluable in stock trading from you which money cannot buy. You are the real big brother (老大）who genuinely takes care of people who fall into the longkang. My last post in this forum is about the last part of the true story of the professional stock trader and his deceased friend. Although the professional stock trader's deceased friend didn't get back a single cent, it seemed that he was more concern of his well being and family, than the money. His last wish to his wife was that, after his death, inform the professional stock trader to come to his wake and passed an important letter to him. The professional stock trader was informed but he didn't show up to pay his last respect and that important letter was handed over to the lawyer, as instructed. What I later witnessed was that, the professional stock trader's deceased friend had left a substantial amount of money to him but he missed the deadline to claim it. And the lawyer was instructed to donate that substantial amount of money to a long list of designated charitable organizations. I visited his deceased friend in the hospital a couple of times, prior to his death throughout the year of 2011. He was someone whom I knew since I was a teenager. His family was fully aware of the money loaned to that stock trader when he revealed the details to me at the hospital and at his home. He passed away 3 hours after he and his whole family returned from a 5D4N short cruise holiday. The one who left this world peacefully without much pain and suffering is a blessing. The one who remains in this world often suffers from regrets and mistakes. That professional stock trader's deceased friend sincerely helped him with a 6-digit sum of money as seed capital. it was GOD's blessing to him during late-2008 to early-2009 when market hit bottom then. He did exceptionally well in his portfolio, particularly on one stock, which he had vested heavily, turned out to be a 12-bagger. Just take F&N as an example to cite that the timing to buy stocks at cheap was the best then. If one bought F&N around S$2 to S$2.50 then, the stock was a 1-2 bagger even if one sold it off too early. "When there is no win, no lose, nobody has anything to say. But when you make or lose money, there will be disagreements." Success blinded him to become greedy for more profits; he ignored his deceased friend's advice to lock in some profits when market was extremely volatile again. He never thought of taking some profits off the table to repay the seed capital loaned to him, when times were good. what he didn't foresee was that, he was back to square one due to character faults. Although his deceased friend didn't get back a single cent, it seemed that he was more concern of his well being and family, than the money. Btw, I've no problem leaving this forum immediately when I'm not welcomed. It's a reflection of my true character to behave and respond to x-factor and now you, in such a situation. A bully will fight until the victim drops dead; it's better to run road before I'm killed. Bro Jie Lun, personally I feel you may have over-react on the phrase. Though you have stood firm and strong on TA, it is not possible to convert ones thought/view by simply going out against those that choose to disagree. In this case of Da Lole John, I can honestly tell you that our read cover all aspects including TA. There has been no tool that can precisely predict the future movement of the market, which is why as trader we will try every mean to sharpen our read with what we can get our hands onto. It is only through experience plus trial and error that we hope will enables us to get as close to the monkey possible. You think John easy to bully. You dare not do it to Xfactor and some more call him Mentor. There are valuable in both you and Da Lole John's view on the market movement. If really want me to describe, I would say you two are make of different general - one that learn through playing war games while the other learn through real-life fighting environment. Having said that, there is nothing to champion who is doing the right stuff more like doing the appropriate stuff at an appropriate timing. Nothing to do with views, market movements and environmental factors. It's a reflection of my true character to behave and respond to him in such a situation. It's exactly the same scenario which I had with x-factor in TPG forum, last Sep 2012. The last time he accused me of something which was not true I stood up and told him off. This time I stand up and tell Johnpaul that "It's not true that charts are irrelevant at any point of time." x-factor was and still always a great mentor to me in my study on TA, to-date. He didnt say that lah. We have a good and peace loving home here. Let's keep it that way....ho boh? And conserve our energy to fight the market instead. One who allows indignity to happen repeatedly deserves no sympathy. "Chart got no more relevant for the time being." This is an outright insult to all chartists! YES! I feel very disgusted with your statement. I paid an expensive course fees for chart analysis and post charts here not to be insulted that charts are irrelevant at any point of time. Yes, But if a person is charitable enough he will just close one eye to let me learn at the window. Anyway , you are right. You pay peanuts you get monkey. That is why I said my TA is Half past six. I never claim that am an expert. You never see I tell mr Nottibird that I am not qualified. Don't do harm to others but must be vigilant so as not to be harmed. It's a blessing that I didn't reveal my vested interest in any stocks with respect to the charts I posted in this forum. Btw, I believe it's worthwhile to pay for that expensive TA course with the profits I made from the stock market. The scorpion knew its life would be endangered if it stung the frog to death with its sting, yet it still had to do it. Why? Because it is in its nature. What your longer term view for the STI? Or will break uptrend to go lower? Innocent until proven guilty; the uptrend of the STI is still intact. My longer term view for the STI is "kopi-o-di-low" and "Kopi-o-dai-dai". The crux of the STI is @ 3181, the neckline of the H&S formation. The 2013 Bradley Turn Dates would still be valid if 3181 is broken convincingly on 22nd Jun 2013. STI closed with a spinning top @ 3291.08 (-20.29, -0.6%) on 3 Jun 2013. Immediate resistance @ 3300, immediate support @ 3250, next support @ 3235, strong support @ 3181. STI may hit the 200d SMA strong support @ 3181 by 22nd Jun 2013. The Simple Moving Average (SMA) is the average price of an asset over a certain period of time. It is calculated by adding up the closing prices over a certain number of time periods, and then dividing by that number of time periods. SMA’s are used to measure momentum. The most watched SMA is the 200 day, it is widely recognized as the dividing line between bull and bear territory. At Least you are a student. Me cannot afford the school fee. Got to stand at the window and learn for free. Whatever goods and services are provided, they must be paid for by someone; you don't get something for nothing. There's no such thing as a free lunch, if you pay peanuts you get monkeys. English translation: It's more blessed to give than to receive. I was in this counter for the last 3 weeks. I cut my positions yday and took a loss. For some reason, people... I suspect funds... are getting out. And they are not done yet. For this kind of stock, one man's meat is another man's poison. Whilst one fund may want to get out, another fund may want to wait for it to bottom out first, and then get in. So you just keep this fellow on your Watchlist and tailgate it. When the selling ends, the price will stop dropping. But when the bottom is reached, the fund or funds who are eyeing this fellow will start to load up. That's when you join in and ride on him. When the bottom is reached, the 1st 10 cts gain will come easily... probably within a day or two. And since you mentioned this counter, I will chio you to keep an eye on AscendasREIT too. Same story with AscendasREIT. Somebody big has been selling and selling macam its the end of the world. bottom will be achieved within 2 days. I am standing by for these two to bottom out. CapitalMallAsia closed with a spinning top @ 1.92 (-0.03, -1.5%) with extremely high vol. done at 13.3m shares on 31 May 2013. Immediate resistance @ 1.945, immediate support @ 1.91, the 200d SMA. I posted this in TPG forum in Aug 2011 that someone kena caught LONG 200 lots Cosco @ $1.70 using CFD a/c and had to cut-loss at > 20%. Even if you are glued to the screen; using CFD a/c to trade (long/short) is a double-edged sword when price suddenly spikes (up/down). For VARD, the Elliott Wave pattern is negated as wave-4 has overlapped wave-1. VARD (formerly known as "STX OSV") closed @ 1.12 on 31 May 2013. 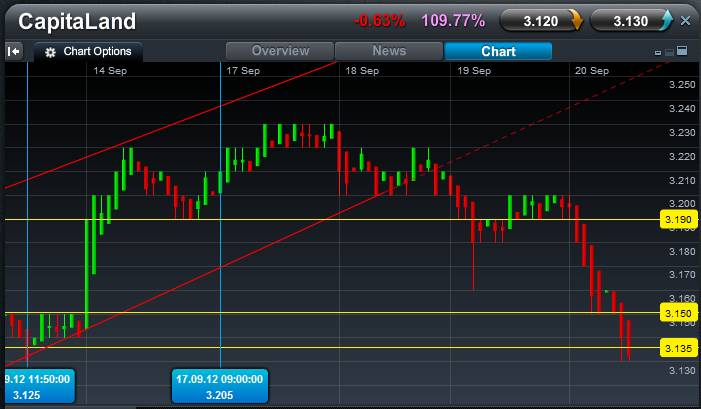 Immediate support @ 0.985, immediate resistance @ 1.18. Rule 1: Wave 2 cannot retrace more than 100% of Wave 1. Rule 2: Wave 3 can never be the shortest of the three impulse waves. Rule 3: Wave 4 can never overlap Wave 1. I found this in cyberspace. Can use their recommendation to draw trendlines to calculate Price Target for Wave 5 ? Wave 5 will end higher than peak of Wave 3. And if you are right on this... it means ST Engrg is going to rebound strongly to above the Previous High of $4.46. She closed at 4.09 after hitting 4.03. A move to above 4.46 means a move of at least 37 cts from Friday's closing. Wow! Hope you are SUPER CHUN on this reading. [h=3]Price Target for Wave 5[/h]Quite often you will see a wave 5 that is equal to wave 1, or 61.8% to 76.4% of wave 3. If there is a wave 5 extension, then wave 5 is commonly 161% of wave 3, or 161% of the sum of waves 1 and 3. Figure 7.30: Price target for wave 5, method 1. 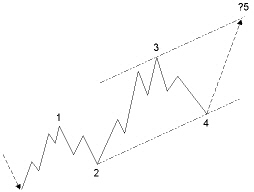 At the end of wave 4 in figure 7.30, draw a trend line through the end of wave 2 and wave 4. Draw a parallel line through the top of wave 3. The upper side of this trend channel is the target for wave 5.
the making of wave 5, or when wave 3 was weak with just a moderate move. Usually, wave 3 has the highest acceleration compared to waves 1 and 5. 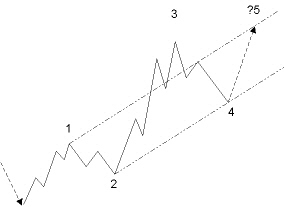 Figure 7.31: Price target for wave 5, method 2.
the end of waves 2 and 4, but draw the parallel line through the top of wave 1. This line will cross wave 3 and give a more moderate target for wave 5. Then Wave 5 target is where har? For ST Engg, use the s/r trendlines to gauge the price movements, i.e. if 3.74 is broken convincingly & hit lower @ 3.65, the chart pattern will be negated. Also see below an example of a truncated wave 5 in Capitaland's chart, i.e. since wave 5 didn't move above wave 3, the chart pattern is negated. ST Engg has similar chart pattern as F&N, i.e. the current pullback may be wave-4 (see below). ST Engg closed with a hammer @ 4.09 (-0.08, -1.9%) with extremely high vol. done at 8.87m shares on 31 May 2013. Immediate resistance @ 4.15, immediate support @ 4.00. The last line of defense is @ 3.74, the 200d SMA. Can I trouble you to post the charts of Starhub and ST Engrg. I would like to know where are their possible bottom or bottoms. I posted the F&N monthly chart in early-May 2012 for TPG forumer, Odie who was vested then. I would like to follow-up on F&N with regards to the Elliott Wave Theory. the pullback to 6.09 (-0.90, 12.9%) in early-Jun 2012 didn't hit 20% or greater from the peak at 6.99 then. And the stock continued its strong uptrend to hit high of 9.64, prior to the trading halt on 19 Feb 2013. This is a good example of an extended wave-3, which means the current pullback may be wave-4. As long as F&N doesn't fall 20% or greater from its peak @ 9.64, it still has potential to continue it extremely strong uptrend. StarHub closed at day's low with a long black marubozu @ 4.01 (-0.13, -3.1%) with extremely high vol. done at 8.4m shares on 31 May 2013. Immediate resistance @ 4.05, immediate support @ 3.99. The last line of defense is @ 3.90, the 200d SMA. 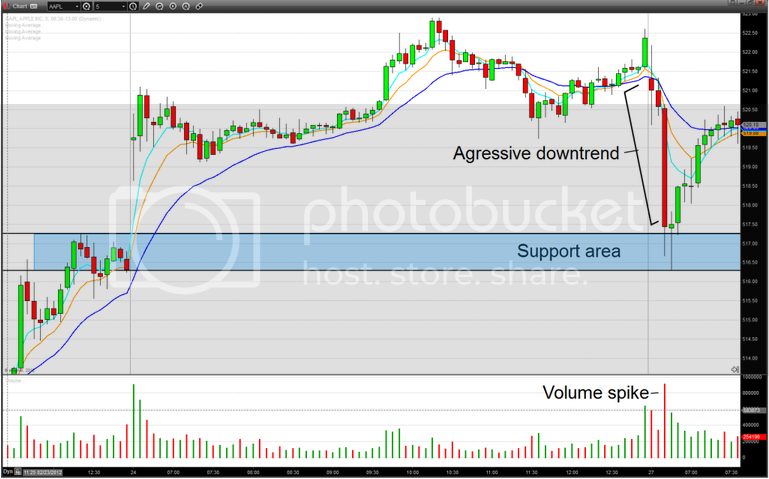 StarHub: Will It Have A Strong Rebound? The telecommunication sector has been performing strongly for a few months now. It was also the sector that help the Straits Times Index to achieve new highs for the past few months. However, this trend took a turn recently. StarHub dropped quite severely recently. It has been dropping for the past five trading days. The reason why this stock is worth looking at is because usually a strong stock does not just turn weak and trend downwards. Chances are, they will at least have a strong rebound before the downtrend. We can see that StarHub has not had any strong rebound yet since the pull-back. Besides, it already dropped a lot from the recent high at $4.75 to the important support at around $4.29. It is likely to have rebound in the next few days. One may consider buying on a pull-back to catch the rebound. The stop loss will be a few ticks below the support. But one thing investors need to take note is that the stock has dropped too much, a uptrend is not likely to resume soon. The strategy is just to catch a rebound and the stock may NOT hold for mid-term to long-term. Bro Zuolun... no angry lah, i respect people that pay good money to learn charting and you are selfless to share your knowledge here with us snipers... how each interpret the chart to determine their position is their par sar. Acquiring new skills is a lifelong process; if someone could help improve my performance in stock trading for a fee within my budget, I believe it's value for money. penny is controlled by CK so it is up to them. Blue cheat is control mostly by fund so if they want to sell, they will not stop in only 1 day or 2 days. You hit the nail on the head; blue chips and funds-favourite SREITS are racing to the bottom. "Live by the sword, die by the sword". The "sword" here refers to the top 6 stocks in STI. it should also have equal strength to swing the STI down by the same magnitude. John's statement was, I believe not a blanket statement lah. Becoz many times in this forum, he did thank you for your charts and your TA views. Why not happy with my statement. I am just saying for the time being. Okay I did qualify my statement. The last time I had free access to Heikin-Ashi was 20 Sep 2012 when I just joined this forum. A subscription fees is required for the software. As I'm a trend trader, not an intraday daytrader, so I didn't subscribe for it. If you're a member of shareInvestor.com, you get good discounts to subscribe for a software called "Consensus Estimates". It's quite useful to gauge the overall trend and sentiments of a specific stock. In that case can you post the Monkey's Charts for these two? And what chart is that? Teach leh.